FREE Boost for Your WiFi – WhizComms Offers FASTER Surfing Experience without Having to Pay More! 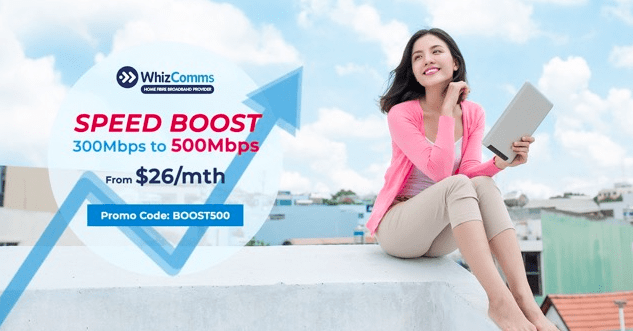 WhizComms will be Giving FREE Bandwidth Boost to 500Mbps for All Subscribers of their 300Mbps Broadband Plans from Now till 31 July 2018! On top of FREE Bandwidth Boost from 300Mbps to 500Mbps, subscribers will get additional up to $137 worth of discounts! No frills plan available, no extra cost for items that subscribers do not need! Just so to let all customers get more than what they’re paying for, WhizComms will be offering a COMPLETELY FREE upgrade of its home broadband bandwidth from 300Mbps to 500Mbps to all its 300Mbps Home Broadband subscribers from now until 31 July 2018! At only $26/mth for 24 months and $29/mth for 12 months, subscribers can enjoy faster and smoother streaming experience at home, without paying a cent more! To add icing to the cake, all 300Mbps WhizComms Home Broadband Subscribers can enjoy the following perks, with savings of up to $137! Customers have to take note that an NLT Service Activation Fee of $56.71 applies for all subscriptions. Simply visit WhizComms’ website at https://www.whizcomms.com.sg/promotions/500mbps-speed-boost/ and enter the promo code <BOOST500> to enjoy the promotion! Promotion ends on 31 July 2018, 1159hr. WhizComms is a service provider that aims to provide communications services at the lowest prices, highest quality and with the shortest contracts. Effective communications have become a requisite in every consumer’s lifestyle. WhizComms understands the impact communications services have on productivity. Its philosophy is to provide best-of-breed and reliable communications services at an affordable price that are easy to subscribe, fast to implement and simple to use.